Aquasolve is a biocide free surfactant that permanently dissolves water in fuel by breaking down the elements at molecular level and causing hydroxyl migration that bonds the hydrogen to the long chain carbon (fuel), eradicating the water content as we know it. This enhanced fuel, now without any water prevents corrosion or oxidisation of engine parts, improves the fuel burn and results in better engine performance. From the moment fuel leaves a refinery it is contaminated with water. This contamination increases throughout the delivery process giving multiple ‘end user’ issues. Water in the fuel tank will inhibit engine performance and cause it to run as if being starved of fuel. It will also rapidly wear and oxidise engine components resulting in injection damage and seizure. Through hydroscopic attraction when being transferred or transported and condensation while being stored, water collects and gravitates to the bottom of the tank; Biofuels being particularly susceptible. Usually this water has to be drained off and disposed of as contaminated water before it gets drawn into the fuel system or attracts the bigger problem of micro-biological growth we know as Diesel Bug which will render the fuel unusable and if allowed will block the fuel system. Aquasolve turns this water back to fuel by dissolving the same as mentioned above. Aquasolve is now available to add to any hydrocarbon, bio and aviation fuel to eradicate the problem of water contamination, improve engine performance and reduce both carbon emissions and fuel consumption. Aquasolve is the result of extensive research to form a biostatic surfactant that has been laboratory and field tested to dissolve water in fuel permanently. 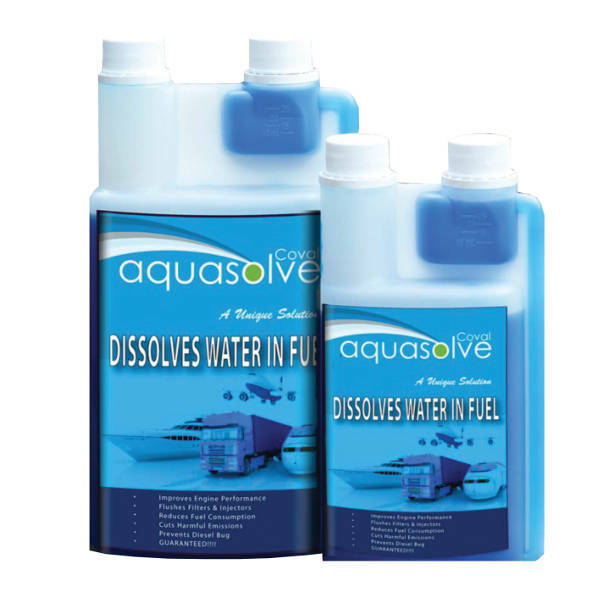 Regular use of Aquasolve will prevent microbiological or fungal growth known as Diesel Bug that quickly forms and will be drawn through the fuel system to rapidly clog up filters and damage injectors. Aquasolve has been tested extensively at London’s City University, where there are still remarkable samples proving a stable fuel-water solution after more than 12 years (and still counting) and in a similar period trialled over and over under extreme conditions being put into contact with every material likely to be found in any combustion engine without any detectable or adverse results. Aquasolve is not only ready to be added to any fuel in any engine, it can be further applied to work with crude or heavier fuels with the same positive effect. Exhaustive compatibility testing provided the technology with an acceptance within the industry beyond what could have been expected of a ‘new’ invention. The compatibility testing protocols used were very similar to those currently required by the aero industry for aviation jet fuel. This testing is also applicable to the oil industry. The original formulation of Aquasolve, specifically designed for use with crude oils, rather than middle distillate fuels, gave the best results to date. Aquasolve Fuel Treatment is a vital tool in modern fuel management programs. Call us for further information and to place your order.